In a superb meta-analysis, Professor Ping-Tao Tseng and colleagues (2018), found that breast feeding reduces the risk of ADHD. The longer the breast feeding was the sole food source, the lower the risk of ADHD. Read the complete article, Material breastfeeding and attention-deficit/hyperactivity disorders in children: a meta-analysis. One should not be surprised by this finding– breastmilk has been the primary food source for babies since the dawn of human evolution. To accept that formula is as good as breast milk is foolish. Breast milk provides the essential nutrients for infants’ growth, contains the appropriate fatty acids for brain development, and the bioactive factors to protect the baby against disease (Oddy, 2001). It modulates the sleep wake cycle since the evening breast milk contains nucleotides that promote baby’s sleep which are different from morning breast milk that promotes wakefulness (Sanchez et al, 2009). In addition, it reduces the risk of asthma, eczema, and allergic rhinitis (Lodge et al, 2015). Despite the commercial advertisements that formal is as good as breast milk, it contributes to neural malnutrition. That babies do develop with formula is a remarkable demonstration of human adaptability. Food is our building blocks. When we consume low quality foods, we may increase the risk of developing illness. This is analogous to using superb building materials when constructing a house as the building is more resilient and may better survive the assault from the environment such as termites, storms, or earthquakes than if built from inferior materials. People, businesses and government have a choice. We can pay the upfront costs to support women to breastfeed their babies for a year by providing paid leave from their jobs or pay much higher long term costs to remediate and treat the deficiencies induced by not supporting breast feeding. If you are concerned about your child’s future health and want to reduce the risk of ADHD, asthma, eczema, or allergic rhinitis there is only one recommendation: Breast feed your baby for a long time period. Lodge, C., Tan, D.J., Lau, M.X.., Dai, X., Tham, R., Lowe, A.J., Bowatte, G., Allen, K.J. & Dharmage, S.C. (2015). Breastfeeding and asthma and allergies: a systematic review and meta-analysis. Acta Paediatrica, 104(467), 38-53. Oddy, W.H. (2001). Breastfeeding protects against illness and infection in infants and children: a review of the evidence. Breastfeeding Review, 9(2), 11-18. Sanchez, C.L., Cubero, J., Sanchez, J., Chanclon, B., Rivero, M., Rodriguez, A.B., & Barriga, C. (2009). The possible role of human milk nucleotides as sleep inducers. Nutritional Neuroscience, 12(1), 2-9. How can people be so caring and sometimes cruel? What are the evolutionary, genetic, epigenetic, developmental, familial, tribal, community and cultural determinants that allow human beings to be heroic and give their own life for others or be killers and unbelievably cruel. Stanford biology professor Robert Sapolsky‘s book, Behave: The Biology of Humans at Our Best and Worst, explores what drives human behavior. It is a remarkable tour de force to explore and explain why we do as we do. Watch his February 6, 2018 lecture at the Jewish Community Center of San Francisco. How come there is no disease caused by the absence of carbohydrates? This simple observation suggests that carbohydrates are not necessary for health and are not an essential food in our evolutionary history. This is different from vitamin C or other essential nutrients whose absence will cause scurvy and eventually death. From an evolutionary perspective, simple carbohydrates, especially sugars and high-fructose corn syrup, are significant contributing factors to the increasing epidemic of obesity, type 2 diabetes, metabolic syndrome, coronary heart disease and many autoimmune disorders. The recommended nutritional guideline of the last forty years to reduce fats and increase carbohydrates were not based upon good science but on ideology influenced by agribusiness and the sugar industry (La Berge, 2008). The recommendations were WRONG AND HARMFUL (Taubes, 2016; see also: https://peperperspective.com/2017/02/18/read-the-case-against-sugar/). It may explains why the obesity epidemic is not caused by eating or drinking too many calories but the eating the wrong type of calories; namely, those found in simple carbohydrates and overly processed foods. The increase in obesity appears highly correlated with the US low-fat diet recommendations published in 1977 as shown in figure 1. The harmful effects of the simple high carbohydrate diet amplified with a decrease in physical activity interacts with your genetics. People, with a family risk factors of metabolic syndrome (type 2 diabetes) can improve their health by eating a low carbohydrate diet with lots of vegetables, fruit and fats. Watch the superb video lectures by Professor Timothy Noakes, an emeritus professor of exercise and sports science at the University of Cape Town and by Gary Taubes, science writer and author of The case against sugar. It may shift your perspective and improve your health. What to eat? Low fat foods, high fat foods…..? 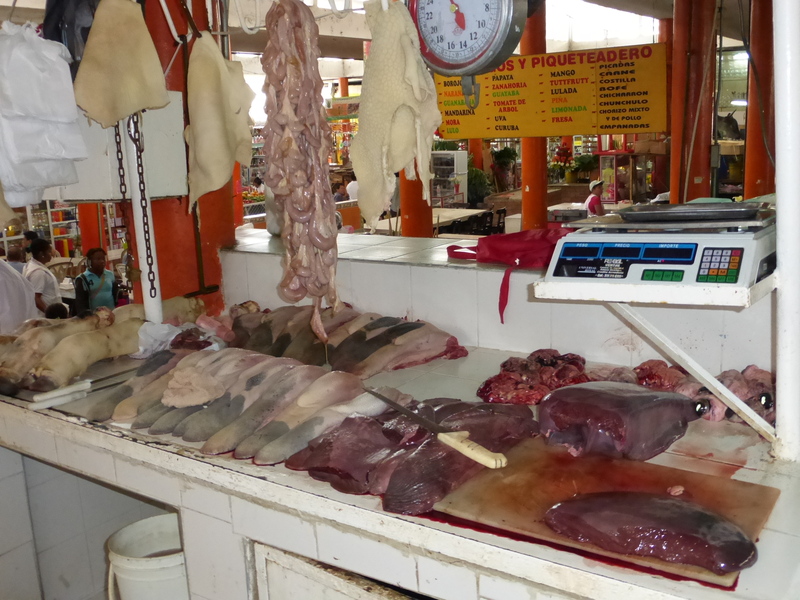 Meat for sale (tongue and liver) at a traditional market (photo by Erik Peper). Should I eat vegetables or meats? Should it be steaks or organ meats such as liver, heart, sweet breads? What foods contributes most to heart disease or cancer? Should I change my diet or take medications to lower my cholesterol? Despite the many years of research the data is not clear. Many public health dietary guidelines and recommendations were based upon flawed research, researchers’ bias and promoted by agribusiness. Starting in the 1950s there has been a significant change in the dietary habits from eating animal fats to plant based oils and fats. It is so much cheaper to produce plant based polyunsaturated salad or cooking oils (e.g. Wesson and Mazola) and hydrogenated hardened oils (e.g. margarine and Crisco) than animal fats (e.g., butter, beef tallow, and lard). Despite the many claims that lowering animal fat intake would reduce heart disease and possibly cancer, the claims are not supported by research data. It is true that consuming liquid plant based oils lowers the cholesterol, but with the possible exception of olive oil, polyunsaturated oils are associated with an increased cancer and death rates in large population studies (Multiple Risk Factor Intervention Trial Research Group,1982; Shaten, 1997). We assume that lowering cholesterol is healthy; however, it is usually a surrogate marker representing a hypothesized improvement in health. A short term apparent reduction in cholesterol levels or other illness markers may mask the long term harm. Only long term outcome studies which measure the total death rate– not just from one disease being studied but from all causes of death–provides the objective results. When looking at the results over a longer time period, there appears to be no correlation between fat intake and heart disease. In fact lowering fat intake seems to be associated with poorer long term health as described in the outstanding book, The Big Fat Surprise–Why Butter, Meat & Cheese Belong in a Healthy Diet, by the science writer, Nina Teichol. Her superb investigative reporting describes in detail the flawed and biased research that underpinned the United States Department of Agriculture (USDA) and the American Heart Association (AHA) recommendations to reduce animal fats and use more plant based oils. Diet recommendations used to be simple: Reduce animal fat intake and eat more plants. Now, there are no simple recommendations because they may depend upon your genetics (e.g., digestion of milk depends whether you are lactose tolerant or intolerant), your epigenetics (e.g., maternal malnutrition during your embryological development is a major risk for developing heart disease in later life), your physical and social activities (e.g., exercise reduces the risk for many diseases), and environment. The recent popularity of the hunter and gatherer diet, often known as the paleo diet, is challenging–it may depends on your ancestors. What hunter and gatherers ate depended upon geography and availability of food sources. The Inuit’s diet in the Arctic consisted of 90% meat/fish diet while the !Kung Bushman’ diet from the Kalahari desert in Africa consisted of less than a 15% meat/fish diet as shown in Figure 1. Figure 1. The food content of hunter gatherers varied highly depending on geography. From: Jabr, F. (2013). How to Really Eat Like a Hunter-Gatherer: Why the Paleo Diet Is Half-Baked. Scientific American, June 3. Use common sense to make food choices. Eat only those foods which in the course of evolution have been identified as foods. This means eating a variety of plants based foods (fruits, tubers, leaves, stems, nuts, etc.) and more organ meats. Ask yourself what foods did your forefathers/mothers ate that supported survival and reproductive success. Carnivores usually ate the internal organs first and often would leave the muscles for scavengers. Eat like your great, great grandparents. They were not yet brainwashed by the profit incentives of agribusiness and pharmaceutical industry. For more information, read the outstanding books by Michael Pollan, The Omnivore’s Dilemma: A Natural History of Four Meals and In Defense of Food: An Eater’s Manifesto. If possible eat only organically grown/raised foods. Non organic foods usually contain low levels of pesticides, insecticides, antibiotics and hormones which increases the risk of cancer (Reuben, 2010). They may also also contain fewer nutrients such as essential minerals, vitamins, and antioxidants (Barański et al, 2014). The beneficial effects of organic foods have been challenging to demonstrate because it may take many years to show a difference. Preliminary data strongly suggests that organic foods as compared to non organic foods increases longevity, improves fertility and enhances survival during starvation (Chhabra, Kolli, & Bauer, 2013). For more information, see my blog, Live longer, enhance fertility and increase stress resistance: Eat Organic foods. Adapt the precautionary principle and assume that any new and artificially produced additives or chemically processed foods–most of the foods in boxes and cans in the central section of the supermarket–contain novel materials which have not been part of our historical dietary experience. These foods may be harmful over the long term and our bodies not yet know how to appropriately digest such foods such as trans fats (Kummerow, 2009). Be doubtful of dietary recommendations especially if you know of counter examples and exceptions. For example, the low fat diet recommendations could not explain the French or Swiss paradox (high butter and cheese intake and low heart disease rates). If examples exist, the popular dogma is incomplete or possibly wrong. Be skeptical about any health food claims. Ask who has funded the research, who decides whether a food can have a label that states “it is heart health” and can prevent a disease, and who would benefit if more of this food is sold. My final comments on nutrition (source unknown). The Japanese eat very little fat and suffer fewer heart attacks than us. The Mexicans eat a lot of fat and suffer fewer heart attacks than us. The French eat lots of butter and drink alcohol and suffer fewer heart attacks than us. The Chinese drink very little red wine and suffer fewer heart attacks than us. The Italians drink a lot of red wine and suffer fewer heart attacks than us. The Germans drink a lot of beer and eat lots of sausages and fats and suffer fewer heart attacks than us. Eat and drink what you like especially if you enjoy it with company…speaking English is apparently what kills you! In class, he fidgets, every auditory and visual stimulus distracts him– he gets up, talks to other students and disrupts the class. Nothing seems to hold his attention, he looks at the page and moments later turns around and disturbs the boy behind him. At home, he grabs his food and leaves the table. He is continuously distracted. The only thing that seems to capture his attention is his computer games. ADD/ADHD has become an epidemic in the last 30 years. Now one in seven boys by the time they reach the age of 18 have received this diagnosis according to the Centers for Disease Control and Prevention, as shown in Figure 1. Figure 1. Rate of office-based visits per 1000 US population aged 5 through 18 with diagnosis (Dx) of ADHD and rate of use of medication (Rx) for boys and girls. Redrawn from: Sclar, D. A., Robison, L. M., Bowen, K. A., Schmidt, J. M., Castillo, L. V., & Oganov, A. M. (2012). 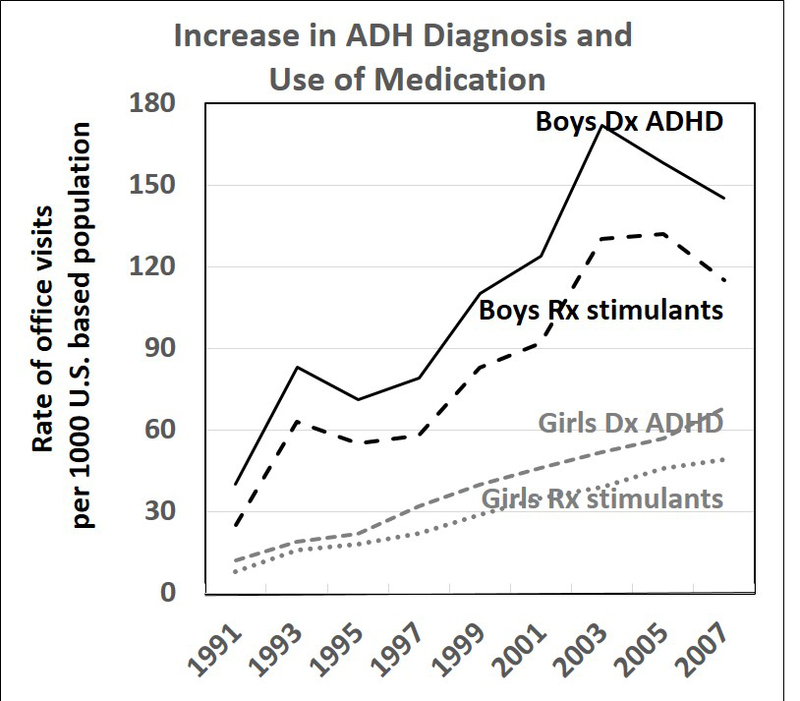 Attention-Deficit/Hyperactivity Disorder among Children and Adolescents in the United States Trend in Diagnosis and Use of Pharmacotherapy by Gender. Clinical pediatrics, 51(6), 584-589. The increase in ADD/ ADHD diagnoses cannot be explained by genetics alone. It may depend upon the interaction of genetics and the environment. It may develop into a disorder as a result of disrespecting and not understanding our evolutionary background during our development. We attempt remedy them with medications (e.g., Adderall, Concerta and Ritalin) that provide an 8 billion dollar revenue stream for pharmaceutical companies. Yet, there is little or no evidence of long term benefits. Self-mastery approaches such as Neurofeedback have demonstrated long term benefits in improving reading, writing, and mathematical scores as well as decreasing impulsive behavior. Neurofeedback training teaches children how to control their brain function. Our modern lifestyle has compromised the healthy development of the brain and behavior. To prevent this we need to support those factors that during the course of evolution increased survival, reproductive fitness and promoted healthy brains. 1) Breast feed children at least for one year and concurrently introduce new foods slowly after 6 or 8 months to reduce the risk of developing food allergies. 2) Respect the importance of face-to-face contact to provide safety, develop empathy and nurture social connection. 3) Encourage motor development such as crawling, playing in nature, and physical movement that occurs while playing games support brain development instead sitting and being entertained by smartphones, computers, tablets or TV screens. Physical movement during play– without being distracted by the overwhelming rapid changing stimuli shown on LED and TV screens–is necessary for brain development. 4) Reestablish circadian (daily) rhythms. Until the 19th century our biological and activity rhythms were controlled by natural light. It is hard to imagine not having light at night to read. When the sun went down, we went to sleep. Light not only illuminates, it affects our physiology by regulating our biological rhythms by blocking melatonin production which interferes with sleep. 5. Support touch and movement with vision and sound to develop the brain. During the first years of life, the baby/toddler integrates the visual and auditory world with touch and movement. Motor development is the underpinning of brain development..
6. Provide constancy and reduce novelty. When reading a bedtime story, the child wants to hear the same story again and again. If part of the story is skipped, the child interrupts and reminds us to read correctly. When the child is stressed, it wants to hear a past story for comfort and safety. Repetition while feeling safe allows memory to create appropriate neural connections. Neural growth depends upon the appropriate level and type of stimuli.Too few stimuli hinders brain development and too many novel stimuli may decrease brain development. 7. Limit hours of watching or playing computer games that trigger orienting and activation. The rapidly changing visual stimuli from these screens evokes the biological reflexes to attend– there is something new and it could be safe, dangerous or life threatening. The physiological processes and the important implications for health and illness have been elucidated by the polyvagal theory developed by Professor Stephen Porges. Over-stimulation with digital devices has been associated with impaired learning and decreased ability to self-regulate. The flood of novel visual and auditory stimuli trains the brain to react, to react again, and again. The ongoing external novelty captures the child’s attention, instead of directing attention from within. 8. Provide face to face safety as infants begin to explore the world. In the last 50 years we have radically increased the visual and auditory input to a developing baby following the concept of more is better. 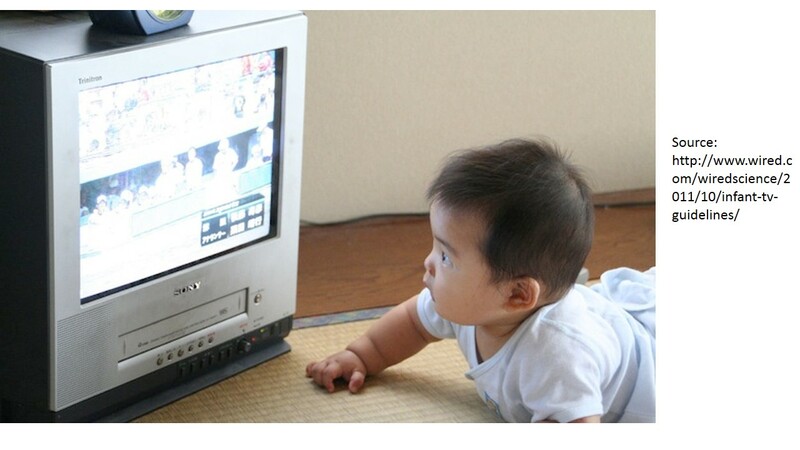 Babies are now exposed to visual and auditory stimuli which rapidly pass by them without repetition or the ability to interact kinesthetically with them. 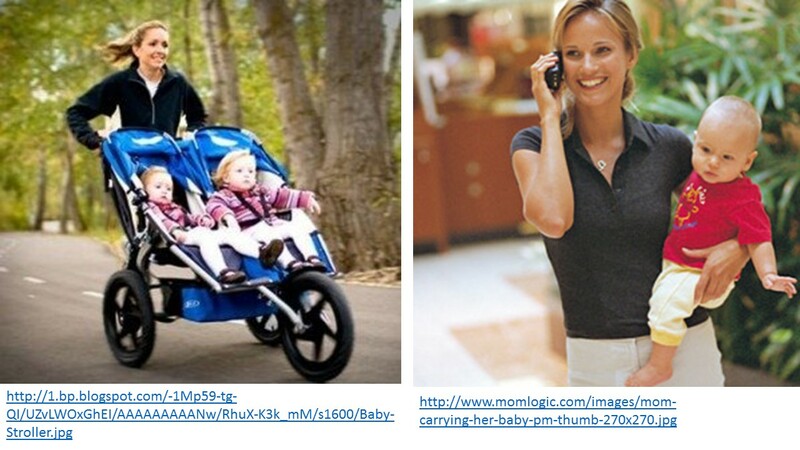 Babies are often carried on the chest or in baby carriages/strollers facing forward- leading the charge into the unknown–instead of receiving face-to-face reassurance from the parent, touching the parent, or hiding behind the parent for safety. In a study of 2722 observations of parent-child pairs by developmental psychologist Dr Suzanne Zeedyk, parents talked twice as much to their baby when it faced them than when the baby was facing forward in the stroller. The impact of stress was measured by the decrease in baby laughing. Babies who faced their mother/caretaker while being pushed laughed 90% more than those who faced forward. As babies become older they do want to face the environment as it is more interesting; however, when the infants feel overwhelmed or threatened there is an opportunity to automatically reconnect with the caretaker to feel safe. In summary, do not park children in front of smart phones, tablets, computer games, and television screens that flood the auditory and visual senses without the ability to integrate the information through touch and movement. Although TV and computer games are superb baby sitters, it is not the same as interacting and playing with a baby and toddler to develop the appropriate motor and emotional control. Let’s create an environment that is in harmony with our evolutionary background–An environment where infants play interactively with objects, explore nature and have face-to-face contact with their caregiver. Even if the initial conditions during growing up were less than optimum, the brain can change—a process known as neuroplasticity. Thus, nurture inner directed attention by having the child develop skill mastery. Learning these skills can include neurofeedback training, back-to-nature explorations, learning to play a musical instrument, practicing a sport or martial art technique, or participating in yoga and meditation. These and many other practices will change the neural structure: it is never too late to learn, change, and optimize health. *I thank Drs. Stephen Porges, Linda Thompson, Michael Thompson, Monika Fuhs, and Annette Booiman for their constructive feedback.